While bread is basic, archetypal food, it’s still not easy to find a good honest loaf of it. Dear old Henry would have been delighted with the bread at Mabel’s. 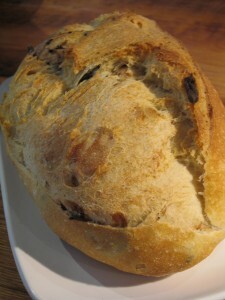 They make lots of different kinds, but the one in the photograph is their Olive Bread—our favourite. It costs $6.95, but it’d be worth anything they felt like charging. Our heart belongs to Mabel’s. Mabel’s is at 1156 Queen Street West (and they have another location at 323 Roncesvalles Avenue). 647-748-4700. www.mabelsbakery.ca.